Unlike other chicken part names, "gizzard" doesn't offer a clue about the location or role of this muscle, but it's part of the bird's digestive tract. When the chicken swallows grit and small stones, the gizzard contracts to serve as a grinder, since chickens have no teeth. In many parts of the world, because they offer inexpensive low-fat protein and abundant nutritional content, these organ meats are a desirable part of the diet, even sold by street vendors. For chicken gizzard, a 3.5-ounce serving, or 100 grams, contains 94 calories. The USDA Dietary Guidelines for Americans recommends the daily calorie intake should range from 1,600 to 2,400 for adult women and 2,000 to 3,000 for adult men, depending on age, metabolism and levels of physical activity. Eating a serving of chicken gizzards will leave plenty of room for the calories from other foods during the day without having to worry about weight gain. The same 3.5-ounce serving of chicken gizzards contains 2 grams of total fat. Only .5 gram is saturated fat, according to the USDA National Nutrient Database. Although saturated fat has no adverse long-term effects, HealthLine suggests that, if you have certain medical conditions, you might want to limit your consumption to the recommended 10 percent of your caloric intake. Most important is that chicken gizzards contain only a trace of trans fat, the kind you should avoid. The monounsaturated and polyunsaturated fatty acids content is .5 gram and .4 gram, respectively, per 3.5 ounces. Unsaturated fats are a healthy part of your diet and often associated with lowering cholesterol levels. A 3.5-ounce serving of chicken gizzards contains 237 milligrams of cholesterol. USDA Dietary Guidelines doesn't have a recommended restriction on cholesterol from foods. However, since your body can make its own cholesterol, it's good to limit dietary cholesterol where possible for a healthy eating pattern. Sodium and potassium have opposite effects on heart health, says the Harvard School of Public Health. Too much salt in your diet can increase blood pressure, which can lead to heart disease. A high intake of potassium helps relax blood vessels, excrete sodium and decrease blood pressure. A serving of chicken gizzards contains 68 milligrams of sodium, which is only 3 percent of the recommended daily value. The amount of potassium in chicken gizzards is 237 milligrams or 7 percent DV, according to the Dietary Guidelines. These figures make chicken gizzards a heart-healthy choice when it comes to the sodium-potassium balance. The nutrition in chicken gizzards that comes from its good source of B vitamins has a direct impact on energy levels, brain function and cell metabolism. 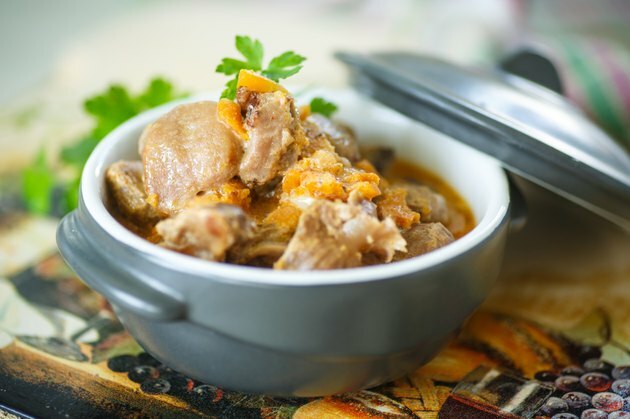 A serving of gizzards provides 20 percent of the DV for vitamin B12 with 1.2 micrograms, which your body needs for nerve tissue health and the formation of red blood cells. A 3.5-ounce serving contains 3.6 grams of niacin — 18 percent of your DV. Niacin is an important B vitamin for your digestive system, skin and nervous system. Riboflavin is necessary for breaking down food, absorbing nutrients and maintaining tissues. One serving of chicken gizzards gives 14 percent DV per serving. Other B vitamins in chicken gizzards are B6, pantothenic acid, thiamin and folate. Chicken gizzards offer a number of beneficial minerals, including 148 milligrams of phosphorus in chicken gizzards, representing 15 percent DV per 100 grams. Phosphorus works with the B vitamins in chicken gizzards to help with kidney, heart, nerve and muscle function. A 3.5-ounce serving of chicken gizzards contains 2.5 milligrams of iron (14 percent of the daily value) and 237 milligrams of potassium (7 percent DV). Your body needs potassium to maintain normal blood pressure. Iron supports your immune system, and both minerals contribute to muscle contraction. Zinc is another mineral found in chicken gizzards with 18 percent DV per serving. Zinc supports your immune system, helps wounds heal and is essential for normal sense of taste and smell. Gizzards also offer selenium, with 25.5 micrograms or 36 percent DV per 100 grams. Selenium plays a vital role in reproduction, thyroid hormone metabolism, DNA synthesis and protection from infection. HealthLine: Saturated Fat: Good or Bad?